A poorly dressed black man with unknown identity barges into Drake & Sweeney law firm office building and holds nine lawyers hostages; Michael Brock being one of them. Although the hostages are rescued and the assailant "Mister", as he called himself, is shot dead by police, the incident puts a strange impact on Michael’s life. Michael, a thirty-two year old successful antitrust lawyer works 80 hours a week on his way to achieve his dream of earning millions a year. His relationship with his wife, however, is approaching a divorce stage. After his encounter with the mysterious "Mister", Michael feels a strong urge of investigating about his assailant. His search leads him to the discovery of an illegal eviction of seventeen people, who were living as tenant in an old warehouse. As a result, a few of the evictees, being homeless now, died during the snowstorm. And to Michael's great surprise, the eviction was found to be forced by his own law firm, Drake & Sweeney. 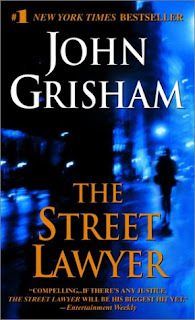 During the course of investigation, Michael meets Mordecai Green, a public interest lawyer, who introduces Michael to an entirely new side of life. Michael decides to leave his firm and become a street lawyer. Evidently this decision demands some sacrifices. Michael, however, is determined to unearth the illegal action of his firm. He begins collecting evidence and even steals a secret file from Drake & Sweeney. This gets him in trouble, though. Although, the story may sound a bit straight and less thrilling, it was the theme of book I found inspirational.